We has so much fun making and playing with this transport sensory tub today! 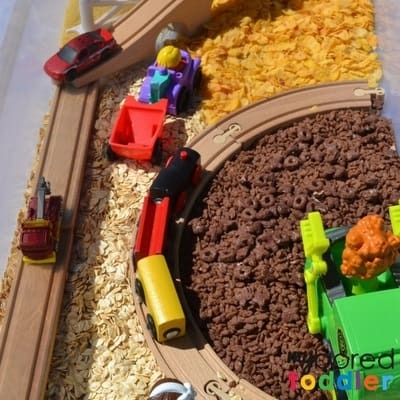 I’m yet to meet a toddler or preschooler who doesn’t love trains, cars and trucks and if you put them all together then you’ll definitely have a fun sensory play activity! 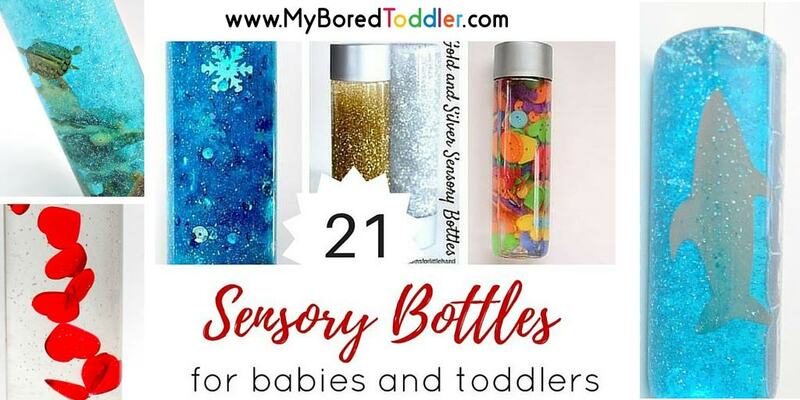 To make this transport sensory tub I used items I already had at home. There’s no need to go out and buy new toys and items each time. 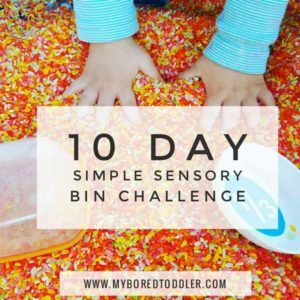 As we talked about in our 10 day sensory bin challenge you want to keep things as simple as possible for yourself. The simplest ideas are often the best. 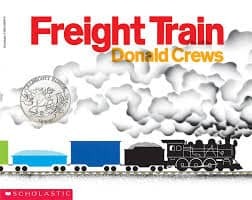 We made this as part of the Virtual Book Club for Kids (you can join the Facebook group here), to go with this week’s book is Freight Train by Donald Crews. If you don’t have the book already you can grab a copy of the board book version from Amazon HERE or you can watch the video below. As I mentioned above, try to be flexible and use what you have. 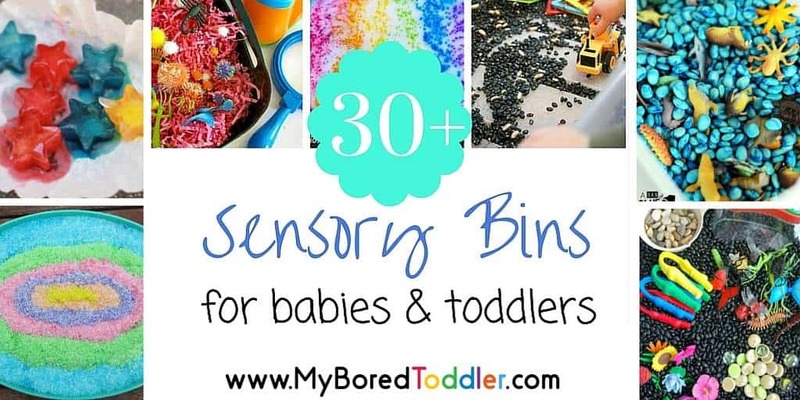 You don’t need to use the exact same items that I used, but this is what I used to create my transport sensory tub (many of these were part of sets we already owned and I’m sure you have similar ones). Long plastic storage tub. I like the long thin sizes as they come with a lid and can easily be stored under the bed. Train & Train track – we used Long plastic storage tub. Other items that would work great would be diggers, cranes and trucks. This is where you get to be creative! Use what you have and the space that you have available in your plastic tub. I really liked the addition of the train tracks as this allowed us to have different sections. 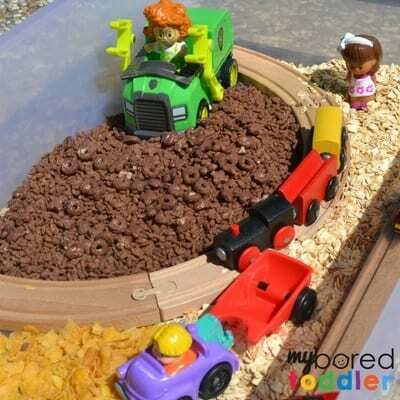 We used the coco pops for a dirt field and put the tractor in there. 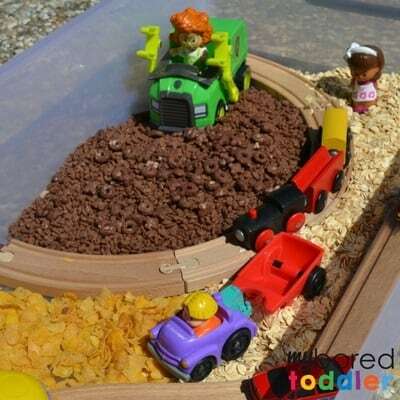 We used the cous cous for the sand and made that a farm with a tractor and some farm animals. There’s no right or wrong way to make it, and let’s be honest – they’ll change it around when they play anyway! 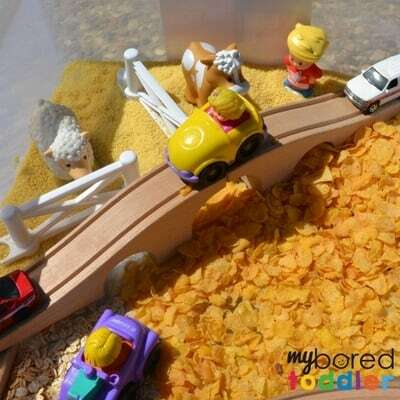 The kids loved the crunching sounds from the cornflakes and the little people farm people and trucks worked well here too. There was lots of pretend play and chatter between the people on the train and the people in the fields. It’s great to listen to the ideas that the kids have when they play! 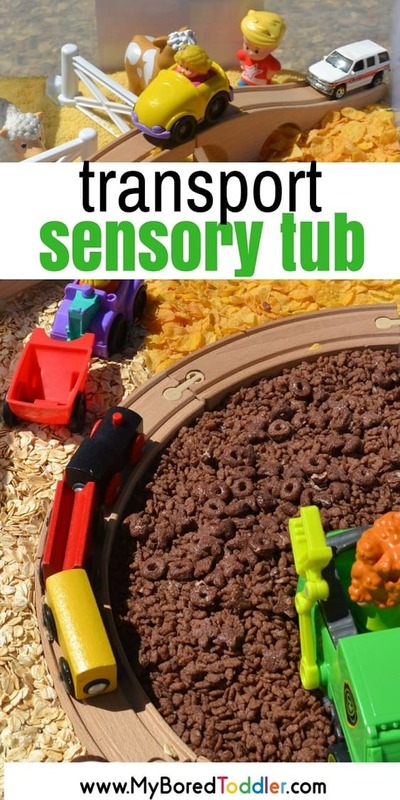 If you enjoyed this Transport sensory tub, make sure you check out these other great transport activities as part of the Virtual Book Club for Kids.